Click Add Employee [a dependent eligible for COBRA must be added as if they were an employee (a separate Qualified Beneficiary) BEFORE they can be enrolled in a benefit plan(s). 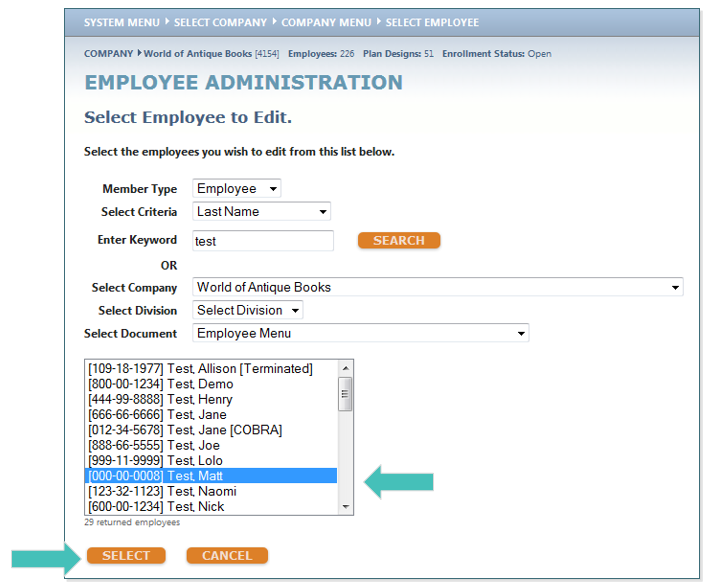 Add the dependent as an employee, making sure to include all REQUIRED fields. • Date of Employment should be the date the dependent becomes COBRA eligible. • Annual Salary can be any amount greater than 0. • No. of Hours Worked per Week should be at least the number required to be eligible for benefits, i.e., 30 or greater. 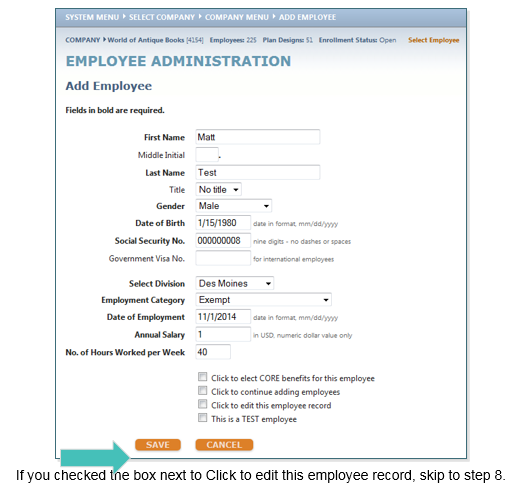 • Uncheck the box next to Click to elect CORE benefits for this employee. Click SAVE. 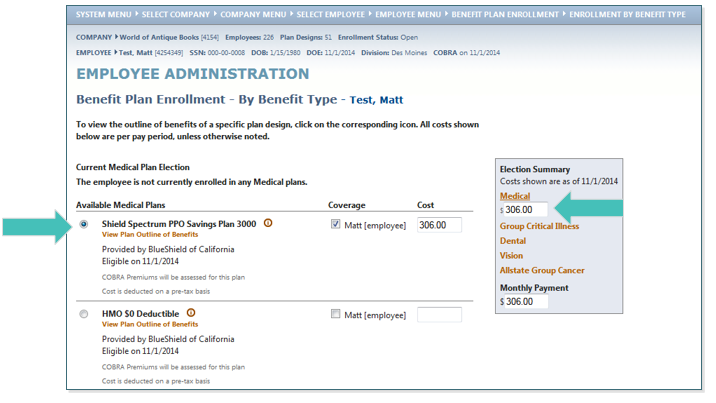 TIP: If you left the box checked next to Click to elect CORE benefits for this employee, benefitsCONNECT® will automatically enroll the dependent (now in the system as an “employee”) in any benefit plans that are designated as a Core Benefit, such as basic life, and will need to be terminated. 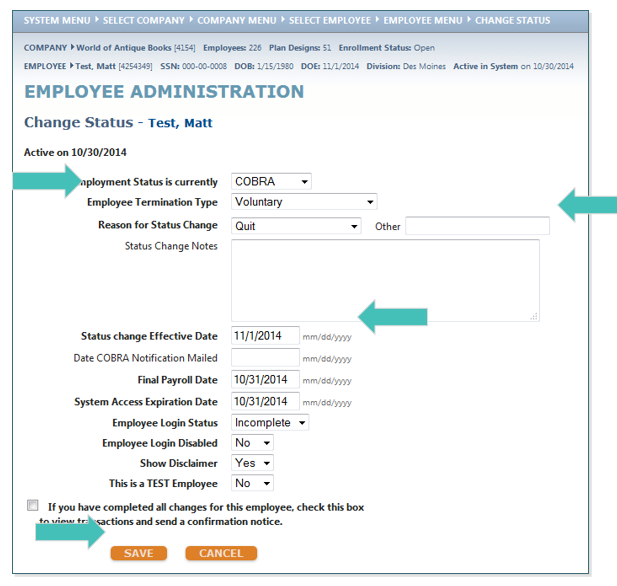 Find the COBRA eligible dependent you just added as an employee and click SELECT. 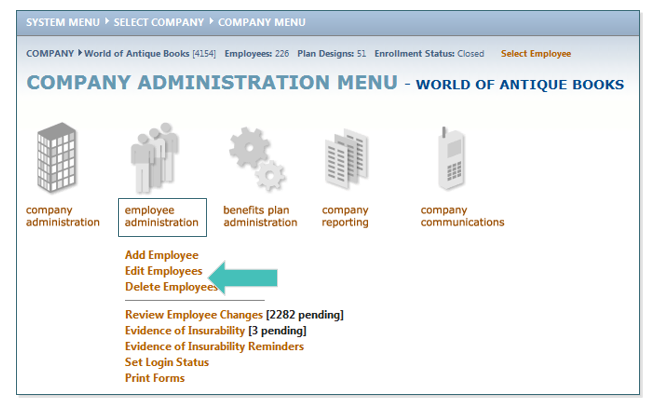 On the Employee Administration menu, click Personal Information and then choose Status. Change the field, Employment Status is currently, to COBRA. • Change the Employee Termination Type to either Voluntary or Involuntary. • Select a Reason for the Status Change. If you select Other, enter more information in the Other box. You can also enter any notes regarding the status change in the Status Change Notes box. • Enter the Status Change Effective Date (this should be the start date of the COBRA continuation). 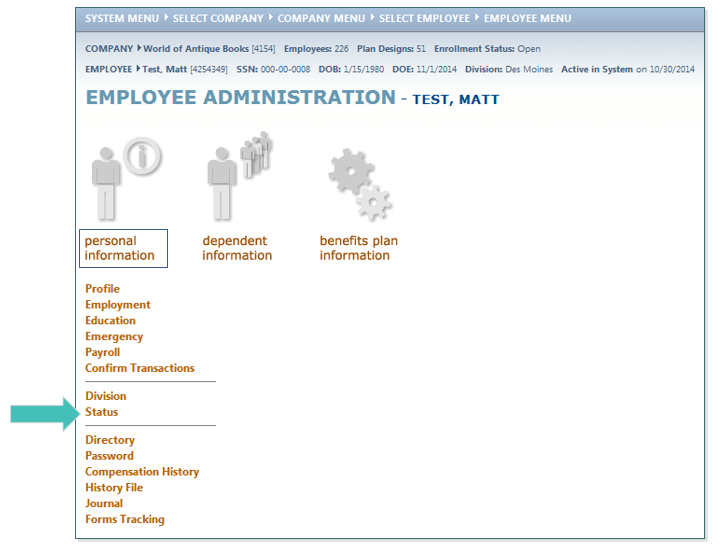 The system will now navigate you to the Employee Administration page. From there, select Benefits Plan Information, then Benefit Plan Enrollment to elect the COBRA Benefits. This is the same way you elect COBRA benefits for an employee. 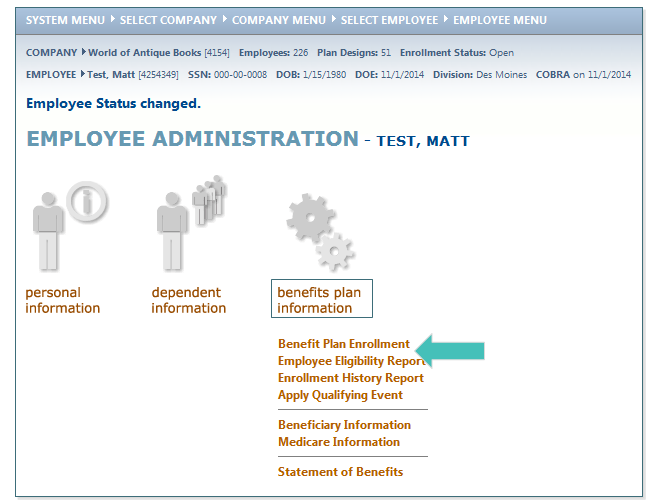 On the Benefit Plan Enrollment screen, you will see in the gray box to the right the benefit plans. Select the link for the benefit plan(s) the dependent has chosen for COBRA coverage, elect their chosen plan(s) and click SAVE.